A "hands on" guide to making this famous pie. I finally get a chance to show off my mum making home made spanakopita! 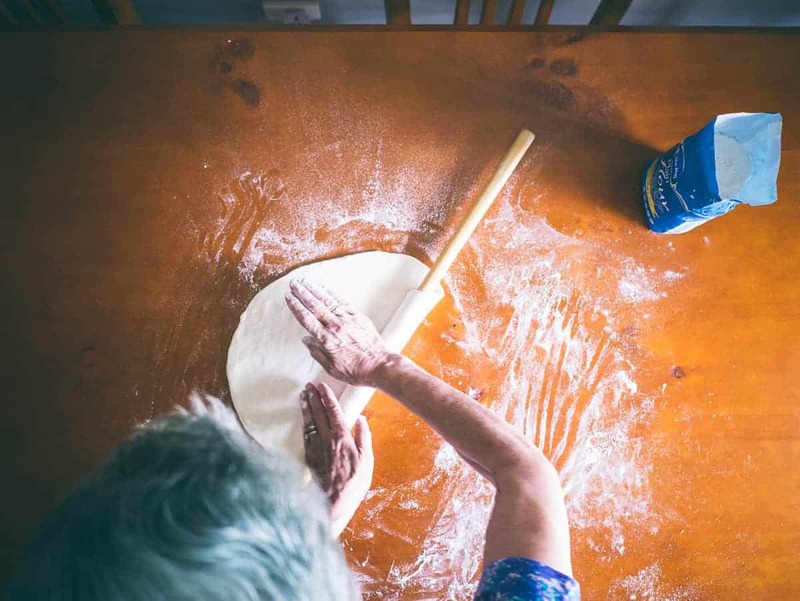 Watch as she rolls out the fillo pastry and make this iconic Greek pie. In all the years I’ve been blogging I can’t remember ever featuring my mother in a blog post. How very Freudian! Jokes aside, I’m quite proud to present you “Mrs G” rolling out some home made fillo and making a simple home made spanakopita. A few years ago she suffered a stroke and I never thought I’d see her in the kitchen again. Through much rehabilitation she is back walking and talking and I have to say a real trooper! I’m so proud of her! Getting the pictures was quite a feat! I had to stand on a variety of chairs whilst my father yelled at me (some things never change!). Greek fathers don’t understand “getting the perfect shot”. It was a lot of fun and I hope to do this again with some of her other recipes. Let’s talk about this home made spanakopita recipe. Again, this was quite a challenge in itself. My mother is “old school” where weights and measurements are pretty non existent. Whenever we talk recipes, it’s always “a bit of this”…”a bit of that”…”I think it’s one cup”… She mostly cooks from memory and feel. You get the idea. As frustarting as it was I managed to get something. Just be wary that it may need to be tweaked from your end slightly. The fillo itself is not perfect. And in a funny way, I’m glad about that. There is a real skill involved in getting the right consistency with fillo and my mother uses a “plasti” to roll her sheets out. 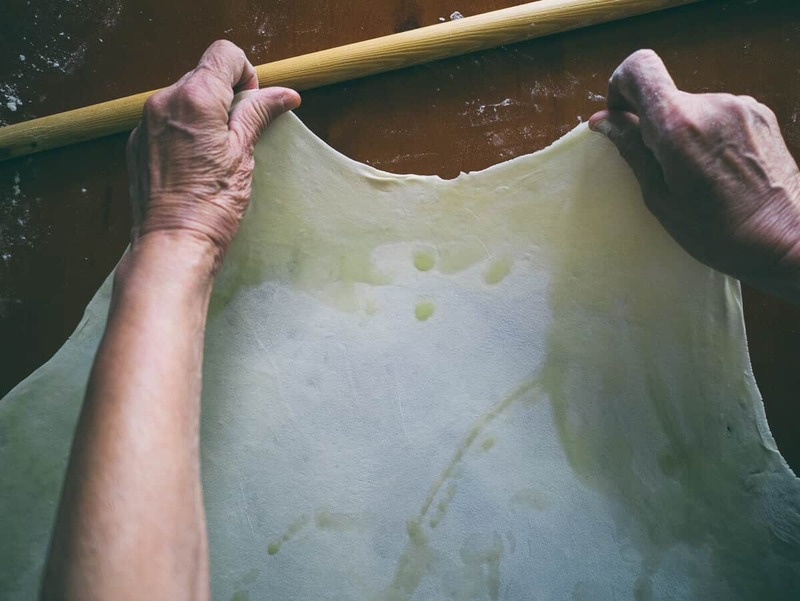 The “plasti” is very similar to a rolling pin except it’s long and thin and resembles a curtain rod. If you want your sheets super thin, you could always use a pasta machine to help out with the process. In these pics my mother likes to roll her sheets out quite large, fill them up and shape them into a coil before cooking them in the “taps”. This pie is similar to the “traditional” spanakopita but like all recipes it varies. The first time she made it I complained about the lack of herbs so when she made it a second time she included the dill and mint for me! Anyway, I do hope you like the pics. Enjoy your wekend and I’ll see you all next week. This is the real deal. Home made spanakopita crafted by my very own mother. You can't get more traditional than that. Place the flour in a large bowl and add the olive oil. Rub the olive oil through the flour until it is fully incorporated. Add the salt, sugar and enough water to form a dough. 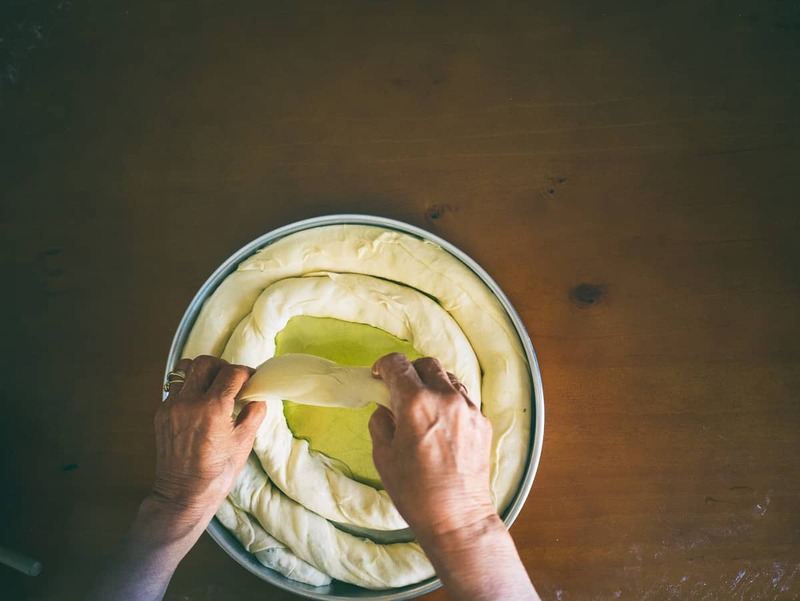 Knead the dough on a large floured surface for ten minutes until soft and elastic. Place it back into a large bowl, cover and allow to rest for ten minutes. Place the spinach leaves into a colander and sprinkle over the salt. Allow the spinach to rest for ten minutes. 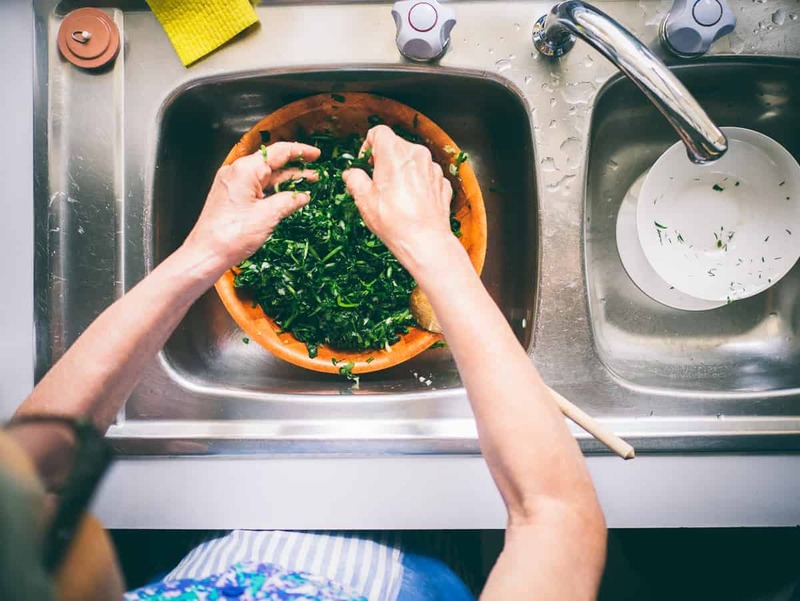 Squeeze excess water from spinach using your hands. Place the spinach in a new bowl along with the feta, ricotta, pepper, eggs and herbs. Mix thoroughly and set aside. To make one coil or “snake” divide the dough into 3 pieces. Place one piece of dough onto a well floured surface. 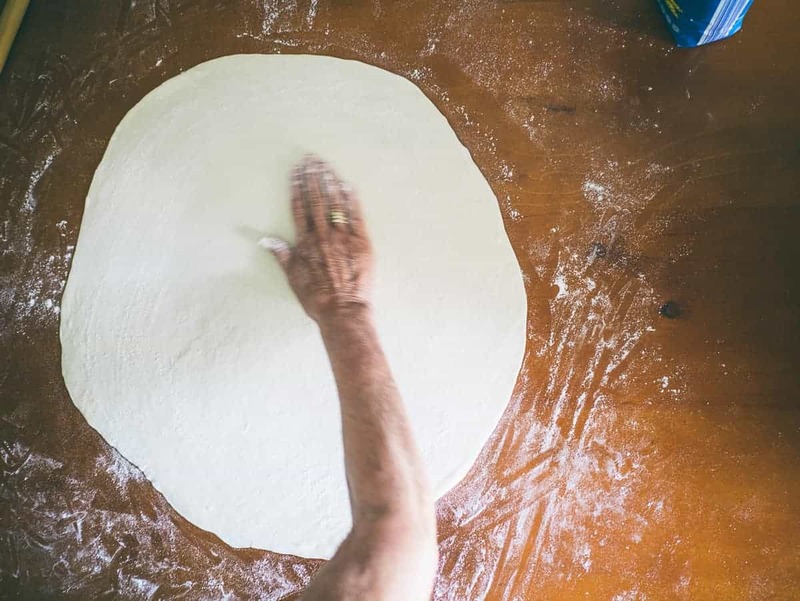 Using your “plasti” or wooden curtain rod proceed to roll the dough to form a circle. Continue rolling ensuring there is enough flour between each roll. You should end up with one large thin piece of fillo. Drizzle a little olive oil over the newly rolled fillo sheet and place ⅓ of the spinach mixture at the bottom end of the fillo sheet leaving a few cms from the border. Roll the fillo up gently ensuring it is shaped like a coil and place into a well greased round baking dish. Repeat with the remaing fillo sheets and filling. Brush a generous amount of olive oil over the pita and bake in preheated 200 deg C oven for 45 mins until golden. Allow to rest for 10 mins. before slicing and serving.